Sun., 9 Feb. - Wed., 19 Feb. Tue., 7 Jan. - Tue., 14 Jan.
Fri., 7 Feb. - Wed., 19 Feb. Tue., 7 Jan. - Sun., 19 Jan. Sat., 8 Feb. - Sat., 22 Feb. Mon., 6 Jan. - Fri., 17 Jan. Sun., 9 Feb. - Fri., 21 Feb. Sat., 8 Feb. - Wed., 19 Feb.
Fri., 7 Feb. - Fri., 21 Feb. Mon., 30 Dec. - Tue., 7 Jan.
Fri., 8 Nov. - Wed., 27 Nov. Sat., 9 Nov. - Tue., 26 Nov. Tue., 31 Dec. - Tue., 7 Jan. Mon., 30 Dec. - Fri., 10 Jan. Sat., 8 Feb. - Fri., 21 Feb. Sun., 9 Feb. - Sun., 23 Feb.
Wed., 5 Feb. - Sun., 23 Feb. Sun., 5 Jan. - Tue., 14 Jan. 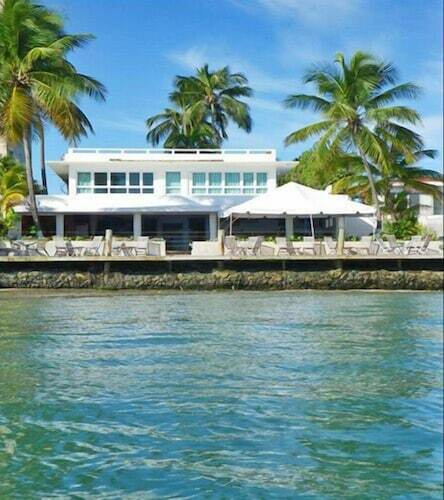 Sun., 5 Jan. - Sun., 19 Jan.
See all 488 properties in Luis Munoz Marin Intl. Located in the heart of Carolina, this hotel is within 9 mi (15 km) of Condado Beach, Puerto Rico Convention Center, and Pier 1. Castillo de San Cristobal and San Juan Cathedral are also within 9 mi (15 km). Set on a long crescent beach 11 km (7 mi) east of Old San Juan, this family-friendly resort is secluded at the east end of the Isla Verde resort district. 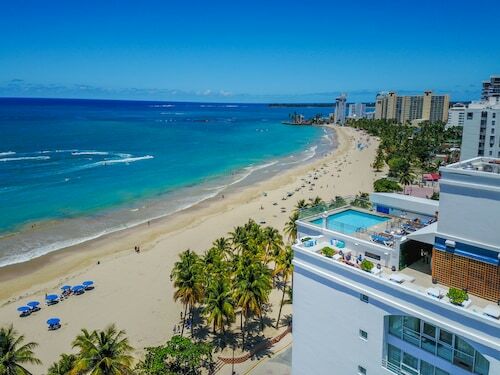 Facing the Atlantic surf, this Puerto Rico hotel in the fashionable Isla Verde resort district serves as one of San Juan's most popular after-dark gathering places for dining and dancing. 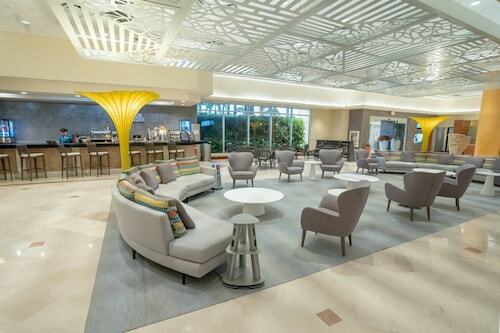 This atrium hotel with a lively casino is 2 blocks from Isla Verde Beach, an Atlantic Ocean playground. Cruise-ship piers are 6 miles away and the popular Plaza Las Americas shopping mall is nearby. This small, chic hotel is across the street from the beach in the Isla Verde resort area; the highly regarded Museo de Arte is 3 miles from the hotel, and Old San Juan is 6 miles away. TRYP by Wyndham Isla Verde is just a short walk from Isla Verde Beach, conveniently located 1.4 miles (2.2 kilometers) away from Luis Muñoz Marín International Airport and minutes from captivating historical sites, business, meeting and social districts. Nestled on the beach, this Carolina hotel is within a 5-minute walk of Pine Grove Beach, Carolina Beach, and Isla Verde Beach. Balneario de Carolina and Barbosa Park are also within 3 mi (5 km). Nestled on the beach, this Carolina resort is within a 15-minute walk of Carolina Beach and Isla Verde Beach. Pine Grove Beach and Balneario de Carolina are also within 1 mi (2 km). Answer : You sure can and you may save money by doing it. The cheapest day to fly in May is Sunday. Having flexibility in your travel plans means you can save more, so be sure to plan ahead when possible. Question : How long do most people stay in San Juan on average? Answer : Of course, you are not most people, but if you were, you'd stay roughly nine days. Question : How much is a plane ticket to San Juan (SJU) from Calgary (YYC)? Answer : Cost can range from $643 to $2,058, prices for YYC to SJU do change more than the majority of routes from Canada. Remember, the sooner you book, the more you'll be able to save. Answer : The cheapest day to fly from Calgary to San Juan is on Sunday. So, if you are trying to save some cash on your next getaway look for flights on that day. Question : What is the cheapest airline flying from Calgary to San Juan? Answer : United Airlines is the leader in keeping prices low for their passengers over the next three months. Fares are being booked at just $643 and, when compared to the more expensive bookings of $2,058, it's quite a deal. Question : What is the cheapest date to fly to San Juan? Answer : As of Apr 22nd, the best day for deals to San Juan (SJU) is Apr 27th. It cost $643, which is 37% below this route's average price.